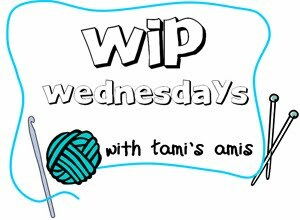 Most Wednesdays, as I am doing a tour of the other WIPW blogs, I find myself adding to the looooong list of things I'd like to make. When I happened upon this pattern via Gingerbread Girl last week I thought I'd give it a whirl with some leftover grey Stylecraft Special DK. I got straight to it! By the time I'd started the second square I decided I really didn't like the slash neck, so I've been procrastinating since last week and trying to decide what to do with the front. The completed square keeps telling me it wants to be the back of a cushion cover and that I should frog the front, but I'm not listening...at the moment. As the hat from Monday is finished, I'm also scouring Ravelry trying to decide what to make next. I have four lovely balls of Rooster Almerino Aran that a friend gave me in a cushion kit she bought - I don't like the cushion so I'm looking for another project for it - maybe a snuggly winter cowl? And in non craft-related WIPs, the MOST important thing this week - and the reason for my absence from Blogland - has been helping my Mum with her plans to relocate from Wales to be closer to us *huge grin*. The last few days have been spent viewing properties. It's very exciting but only the first step in a long process so I'm trying not to get too carried away. Hope to be back soon with more progress - on everything. I think that top is super cute. cant wait to see what you do with it. 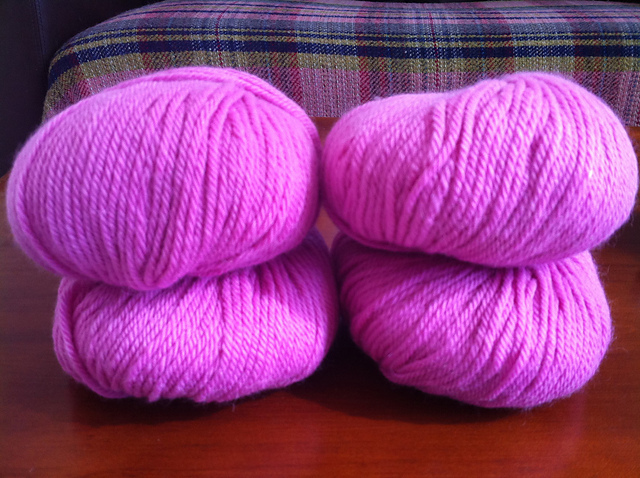 Oooh, that pink yarn is fab, I think a cowl in that colour would be so cheerful on grey winter days! Ps, sorry for teasing with arty shots of the blanket - I just didn't want to confess how little I'd done since the last time I showed it! 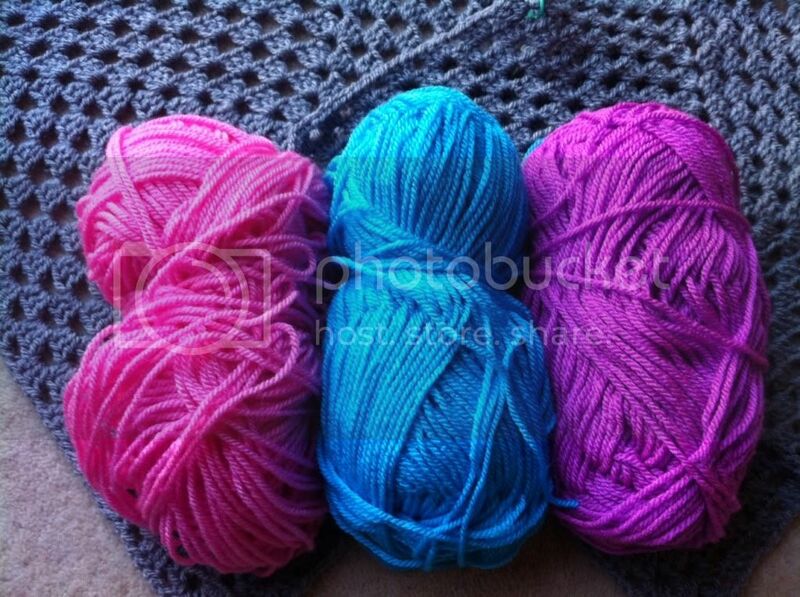 The pink yarn would make a lovely cowl. A cowl in that Rooster Almerino Aran sounds terrific!! Hooray for Mum moving closer! That's awesome! I think that pink deserves to be turned into a cowl. I will try and get some photos for you of the front of the top - Pippa's walking like crazy right now and trying to get her to stay still to have her picture taken is almost impossible! 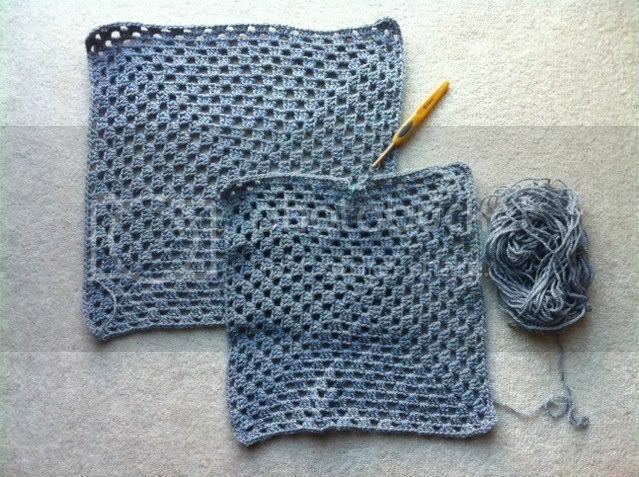 I did have an idea for the front, which would be four smaller granny squares, with the top two only joined half way. Then folding those 'flaps' back and fastening them with buttons to make a collar effect. I hope that makes sense, I'm not very good at explaining without pictures! Oh and I agree, I think that yarn would make a gorgeous cowl - it would be a lovely splash of colour in the winter - or a cute little A-sized poncho! Oh that's great; it's nice to have family a bit nearer! Lovely that your Mam is moving closer,I bet its been great viewing those properties.